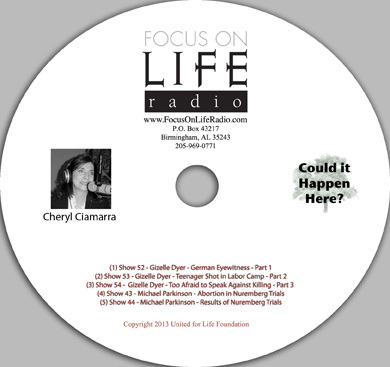 Focus on Life radio, with host Cheryl Ciamarra, entertains, educates, and enlightens its listeners on culture of life issues. Subjects include the family, end of life issues, ecumenical work, and charitable outreach. The show provides a friendly way for people new to the culture of life to learn more, and for those already familiar with its message, it teaches new ways of giving. Exclusive Interviews with Giselle Dyer about her experience in Germany's concentration camp and Dr. Michael Parkinson, Esq. on the Nuremberg Trials.